James Voorhies is the founder and curator of Bureau for Open Culture (BOC) a non-profit nomadic organization for the contemporary arts that operates through unlimited forms of representation in and outside of the gallery space. You have been asked before if you consider yourself a curator, an educator, an artist- curator or all of the above. You have also stated that one of BOC’s purposes was to function as mediator between art and visitors. My two-questions in one is: In your most recent project, I am Searching for Field Character, do you feel like BOC has succeeded in its role of mediator between the art and visitors? And working constantly on the site of the project, have you ever felt like performing your own project? JV: The intention is to mediate as little as possible between the art and visitors. This approach coincides with the kind of institution practice I am working through with Bureau for Open Culture. As a practice, I utilize BOC to take the basic framework of an institution in order to expand, stretch and re-think the kind of mediation that takes place between art and visitors, to propose new kinds of engagement with art by using the exhibition as a medium. For example, in the case of I Am Searching for Field Character and BOC’s occupation of Building 8 on Massachusetts Museum of Contemporary Art’s (MASS MoCA) campus in North Adams, the presence or voice of our institution is intentionally limited. The space itself has a quizzical quality that is not easy to define. Is it an exhibition space? A work site? An artist studio? A market? In fact, the physical site of Bureau for Open Culture is an open workshop where staff and visiting artists work daily and it is an exhibition space where visitors have multiple kinds of sensorial experiences; they overhear private and public conversations about projects taking place now and in the future; they stand among visual and textual information related to a project on exhibit at that moment; they interact with resident artists and witness to the day-to-day operations of the staff; they read about subjects related to current installations. It is an immersive environment where the institution performs a kind of engaged practice by exposing the routine behavior of Bureau for Open Culture, offering an experience of the whole institution as a work of art. In response to the second part of your question, the work of BOC staff is considered a summer-long performance in and around the space-making conversations, relationships and connections with visitors in meaningful and intimate ways that cultivate a unique understanding of that space and the work we do. Visitors leave with their own conclusions because every experience is obviously unique. And, this process in turn forms a new relationship -sometimes more personal because of the human connection- with the institution and with contemporary art than more traditional forms of institutional mediation. I know the project is successful. In reference to your first sentence, I feel a curated exhibition can be no different than putting together a syllabus for a course. I don’t believe education needs to be singled out from an exhibition as some sort of add-on or supplementary department. The exhibition can become an educational experience because knowledge is generated in creative ways, routes that encourage visitors to see and feel something differently, however minimal, about the crazy world we live in today. I Am Searching for Field Character is soon coming to an end. How did the project originate, how did it change and what was the most unexpected thing that happened so far? JV: The project originated out of an interest in the cultural production and work taking place around North Adams and the Berkshires. 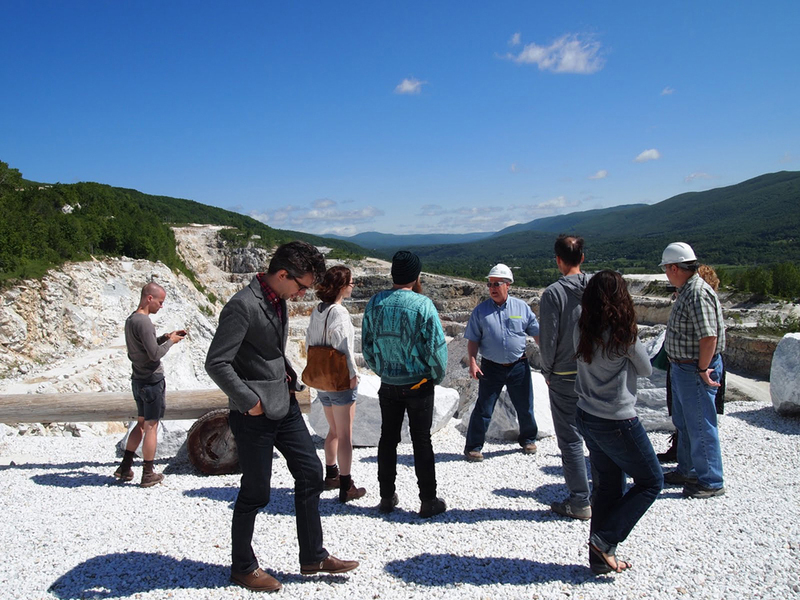 The Berkshires is fascinating not only because of the many academic institutions, arts organizations and organic farms it hosts but also because of the numerous individuals, small organizations and businesses that call it home and make work here. Everything contributes to the overall cultural character of Western Massachusetts and Southern Vermont. I Am Searching for Field Character is based on a short text by the German artist Joseph Beuys, which seeks, as Beuys did in much of his work, to give agency to what might at first not be considered art. Ideas for my project developed from there. While dates for some artist talks have changed or turned into other kinds of events, for the most part plans have stayed according to schedule. However, the talk I was originally slated to give in late July was changed to a dance party! We were feeding off the energy of Bang on a Can’s residency on MoCA’s campus in July. We made friends with the musicians, composers and performers. It was great. During their weeks in residence, they talked often about organizing a dance party. So, instead of the lecture I was slated to give we turned it to a dance party. It was incredibly successful and I think memorable for all Bang on a Can members but even more so for the numerous North Adams area residents who came out for it. We were even contacted at the last minute by a DJ group called Karate. They came down from Schenectady, New York, and played an incredible closing set. It felt liberating to be able to say, hey, the originally scheduled talk doesn’t feel right at this moment and with this crowd. Let’s be agile and receptive to the energy and produce something in response to it. At first that might seem frivolous, but I believe it had meaning and value in the end. That is an important part of what describes Bureau for Open Culture: to take up the framework of an institution but by no means be rigidly institutional in that behavior. This is how BOC uses the institution as a practice. One of the components of the project was the successful beer garden. At the beer garden there were tent-like table menus with no language about food or drink yet a brief introduction about the project itself. I found the fiction of the menus within the context of a beer garden very funny because of the playful, welcoming appearance of the setting (a sort of outdoor pub) and the discreet addressing of the real purpose of BOC in that context. Could you explain that choice further along with the actual intermingling of people which was almost a performance itself? JV: Beer Garden originated as part of the project for a number of reasons. 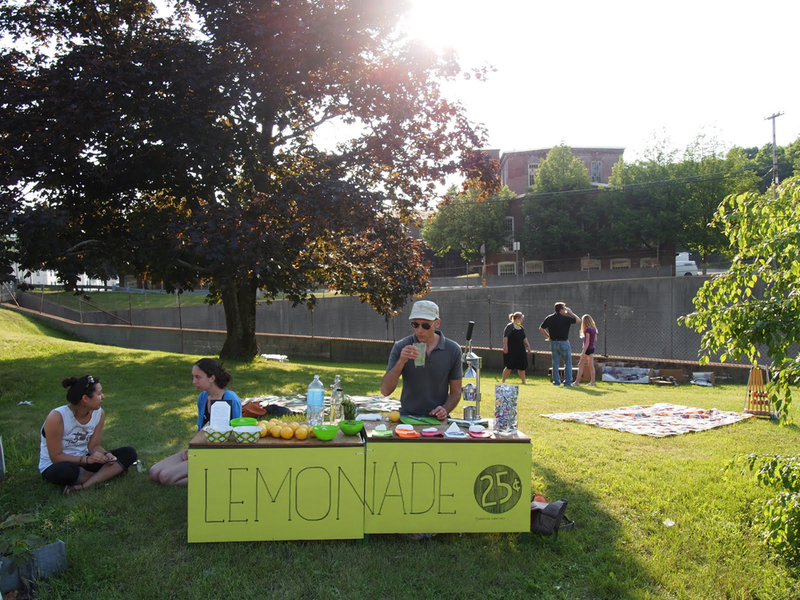 One of the most obvious is that we thought North Adams needed a casual site to have a drink outdoors. It is beautiful here in the summer and last year when we experienced our first warm months it seemed unfortunate that there was no place to gather and sit outside with a beer, talk, enjoy the weather and watch people. 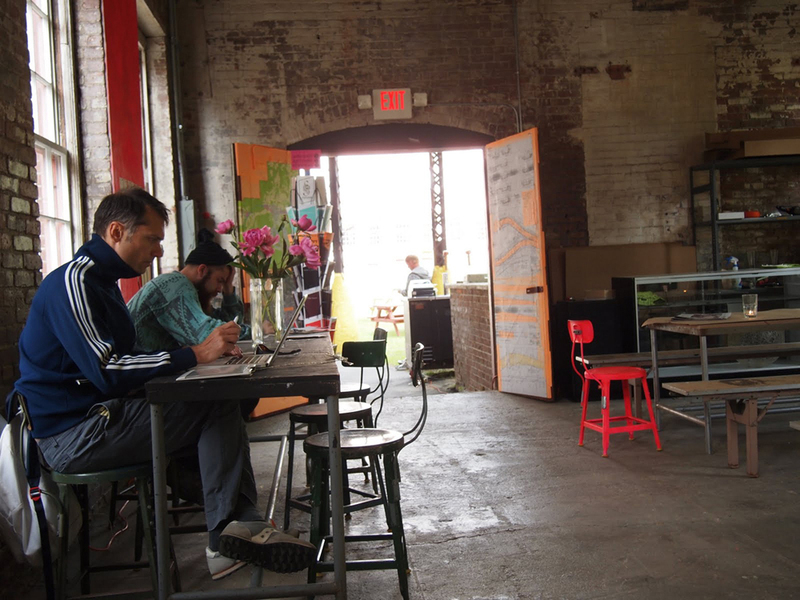 A beer garden is a logical part of the project since the BOC space is nicely located next to the Hoosic River and our door opens up onto the grass behind MoCA. As I continued to think about the context of I Am Searching for Field Character and its examination of different kinds of labor, cultural production and service economies, I thought it would be interesting to consider >Beer Garden within the context of funding the project. It has been rather comical and sometimes challenging because we three are curator, artist and designer (myself, Cassandra Troyan and Nate Padavick, respectively) and we did not know how to operate a beer garden. In any case, that is okay because it falls within the ideas of exchange of labor and economy and thinking about art as part of the cultural service sector ‘cultural tourism’ at once performing the very object of critique. How is a beer garden here or another place, even Berlin, no less a contribution to the overall cultural character of the region than the art viewed inside a nearby institution? For me, >Beer Garden opens up these kinds of internal points of inquiry about the function of art today. But it is also just a beer garden for many and contributes to their time here in North Adams. The table tents that you mention are kind of symbolic of the concept of >Beer Garden as far as how they deploy a familiar framework ‘an everyday table tent’ and buoy it with an aesthetic quality. The table tents are intended to inform people about >Beer Garden and its role in I Am Searching for Field Character, while providing a practical function: a schedule of upcoming events. The beer garden too is a framework. It’s a somewhat skeletal version of a real beer garden, serving only pretzels, offering very limited beer choices and providing no table service. >Beer Garden is not necessarily intended to be a full-on beer garden. It’s a little off. It’s simply a model within which funds are generated to support some of our work and, most importantly, to draw together repeatedly people from the local and regional community, mingle with us and one another and the tourists. The communal nature of the picnic tables forces individuals who may be in small groups to sit within close proximity of one another and, perhaps, to exchange a few words, share a few moments, however temporary or fleeting they may be. Beside the beer garden I Am Searching for Field Character also included free wi-fi and tables where people were encouraged to work, rather than at home. How did that go? JV: This project is called >Work Site. It has gone well, considering the number of people in our city and the percentage of those who are freelancers and might consider working away from home. I’ve been surprised at how many visitors come in repeatedly to work alongside us in the space. The space can at times be hectic with visitingartists, music and movement, de-installing/re-installing, figuring out problems or logistics. But, I thinkthose individuals who choose to leave the quiet of home to work in a coffee shop or shared workspace desirethat kind of background noise. We’ve had a few moments too when people have met one another and learned of each other’s careers, finding common ground / shared knowledge. How much of this project has turned into pure labor and how did you react to that aspect of it? Did you find the physical aspect of it to be an additional connection with the exhibit The Workers with which the project was proposed in association? JV: This is a good question since labor is evidently at the root of the concept of I Am Searching for Field Character. The work of a curator is typically considered immaterial -the production of ideas and content- not so much physical labor like making and doing. But this project actually did take up an extraordinary amount of “pure” labor, as you call it. We have all worked really hard at the beer garden (including our incredible interns!) and at the constant maintenance of the space and programs. It is an aspect of the project would not want to keep up on a regular basis, not so much because of the physical labor but because of its distraction from the work I do in order to continue doing the work I do. What I mean is that I have not had time to write and conceive new ideas for more projects due to the day-to-day work, or performance, at the BOC space. It’s been a good learning experience as far as what can be accomplished over a sustained period and what cannot given the limits of one’s time. In response to your second question, I believe you refer to the physical site of BOC in relation to the main exhibition’s visitor traffic at MoCA? As you say and I explained briefly, I Am Searching for Field Character is produced in association with The Workers exhibition taking place inside the main galleries of the museum. 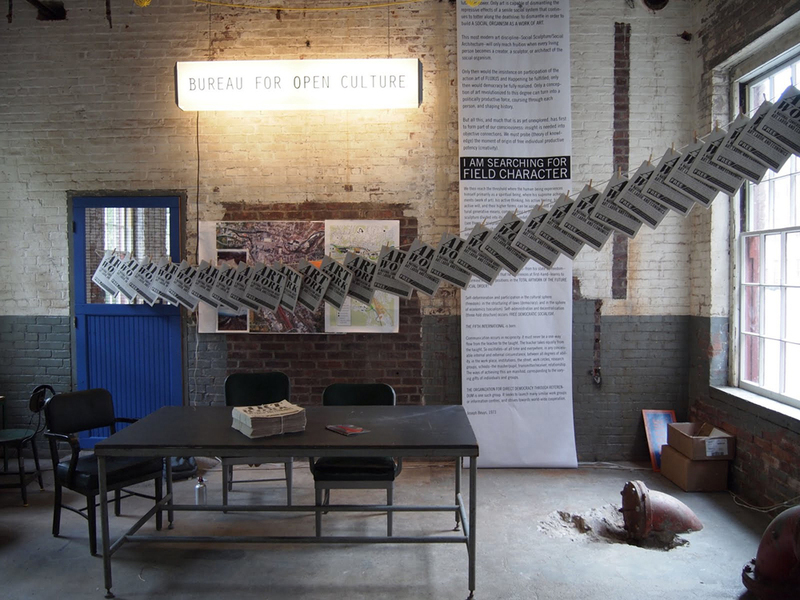 While the introductory text to the exhibition nicely explains Bureau for Open Culture is operating through September in association with The Workers, I am not sure that is understood by visitors. BOC is located remotely from the exhibition site, which inherently forms a disconnect. While we’ve received visitors to the beer garden and built a community around the space through the lectures, conversations and exhibitions, the day-to-day foot traffic we have coming out from the museum is lower than I had hoped. JV: Bureau for Open Culture was invited by Printed Matter to participate in the New York Art Book Fair at MoMA PS1 at the end of September. We will sell our publications and launch a new yearlong project called becoming institution. This project will include partnerships with different individuals and organizations around the world to discuss how the limits of institution can be expanded and how an institution practice can be shaped. We will explore ways of defining BOC as an institution practice. Also, Bureau for Open Culture has been invited by Siena Art Institute in Siena, Italy, for a two-month residency fellowship in fall 2012. That is very exciting. We will begin to think about what can be accomplished there. I Am Searching for Field Character is at the Massachusetts Museum of Contemporary Art (MASS MoCA) in North Adams, Massachusetts. 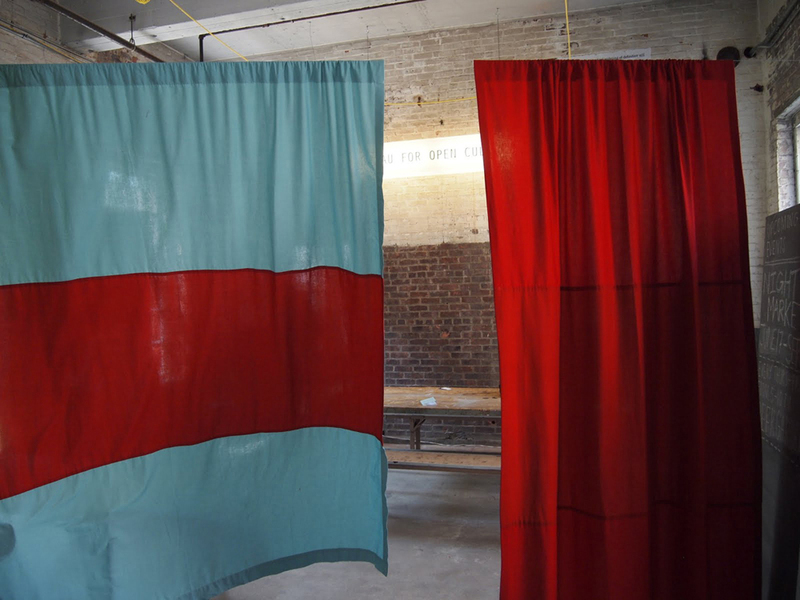 As part of I Am Searching for Field Character, BOC collaborated with several artists, scholars, and organizations including Dylan Gauthier, Julia Bryan-Wilson, Sarah Pierce, Red76, Temporary Services, Printed Matter, and The Wassaic Project.